Kiehl's is one of the skincare brand that I always satisfied with. Because of that I've been evangelizing Kiehl's products to my close friends and families. Lately, I've been running out of a lot of my skincare products, so it's time for me to stock up. My housemate told me that her friend who is working in KLIA can get 10% off from her staff price in Kiehl's at KLIA. So I was taking advantage of her privilege and asked her to get for me a bottle of toner and serum. Sadly, the serum that I wanted ran out of stock, so she only manage to get for me the toner. I've tried 4 different types of Kiehl's toner - (1) Calendula Herbal Extract Toner, (2) Ultra Facial Oil Free Toner, (3) Cucumber Herbal Toner and (4) Yerba Mate Tea Toner. I think the best is still the Calendula Herbal Extract Toner. So, my friend got me the biggest bottle, which is 500ml, for only RM185. The original price is RM210. It smells like chrysanthemum tea, which is very refreshing. It doesn't sting the sensitive parts of my skin (you know how some alcoholic toner hurts your zits a lot). And it helps a lot in providing even skin tone. I wrote down the date that I started to use this toner, and I'll figure out how long that huge bottle of toner gonna last me. I've always been using the Acai Damage Correcting Moisturizer. This is the best moisturizer I've ever tried. It does more than just moisturizing your skin, it also helps repair damage that's already been done on your skin by restoring your skin cells back to its normal form. And the price is quite reasonable... it's only RM170. Because the Acai Damage Correcting Moisturizer is so good, I assumed that the Acai Damage Repairing Serum will be much better (serum has better repairing agent compared to moisturizer if I'm not wrong). So I went on to purchase the serum as well (RM180). You know, it was the last bottle on the shelf!!! Since it's sold out in KLIA and the last bottle in Empire Gallery, I would assume that this is one of the best seller. It's been a week since I use the serum every night. I wouldn't say it's fantastic but it does its job. Maybe I would rate this 7.5 out of 10. But the moisturizer is still the best. Kiehl's Lip Balm #1 - I love this!!! My aunt used to recommend me this but I thought it was a bit pricey (compared t petroleum jelly). After I use it, I think it's one of the best lip balm I've ever tried. And it comes in tube form which is very convenient to use. I would recommend it to everyone who have dry lips and chapped skin. Kiehl's Ultimate Strength Hand Salve - This is too expensive for hand cream. It's probably just as good as normal drug store brand hand cream. So... don't bother. Save your money for something else. Kiehl's Amino Acid Shampoo - My hair is not really that fuzzy. I can never review hair products properly. So.... I have no comment on this product. It's quite nice to use though. 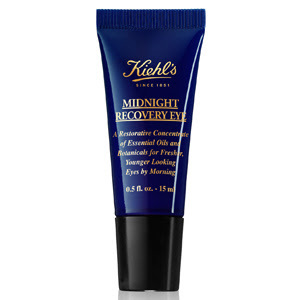 Kiehl's Creme de Corps - This is the original rich nourishing cream. For extremely dry skin, it is good to use this moisturizer. And I think it's good to use during winter as well. But in Malaysia weather, I feel a bit irritated by the thick texture. It is my practice to ask for free samples of Kiehl's new products when I visit them. This time I've asked for the Midnight Recovery eye cream. My aunt also recommended me this. That's all for today. Happy Monday anyone. P/S: Currently I'm in my exam week. Wish me luck!